NEW YORK If Subway's $5 Footlong is too expensive, the chain is now offering a 6-inch sub for $3. The promotion makes Subway just the latest chain to step up its value offerings as the competition for price-conscious diners intensifies. With the broader restaurant industry expected to be flat to modestly up this year, companies are going to greater lengths to convince people to eat out more. Burger King (BKW) this week introduced "King Deals" in select markets, which includes a daily featured entree, small drink and side for $4.99. Wendy's (WEN) recently revamped its value menu and McDonald's (MCD) has been playing up its Dollar Menu. Subway says the $3 deal will be for a rotation of select sandwiches. The "Six-Inch Selects" promotion kicks off in March with the oven roasted chicken sandwich and will run through at least June. A spokesman for the company says the chain previously offered a $3 sub in select markets but that this is the first national launch of the promotion. 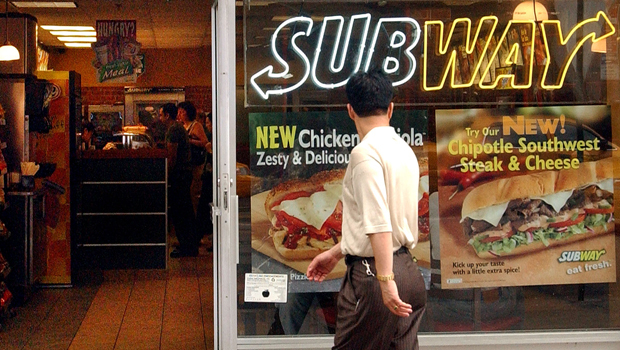 Based in Milford, Conn., Subway has more than 37,000 locations globally.